Proverbs 18:20-21(KJV); A man’s belly shall be satisfied with the fruit of his mouth; and with the increase of his lips shall he be filled. Death and life are in the power of the tongue: and they that love it shall eat the fruit thereof. A man’s belly is satisfied by the fruit of his mouth. Death and life are both the fruits of your mouth. It means that what you confess will either kill or give life. God says, “…I have set before you life and death, blessing and cursing; therefore choose life, that both thou and thy seed may live.”(Deuteronomy 30:19). You make the choice to live every day by confessing right. Every seemingly negative circumstance in your life will present you with this choice. If you are struggling with health, life and death has been set before you, so choose health by the confession of your lips. If your career is not advancing, death and life have been set before you, so choose growth by your right confession. If it is your health, ministry, marriage or any other area of your life, life and death have been set before you. Your confession determines your fruit. Hallelujah! Death and life are both the fruits of your mouth. 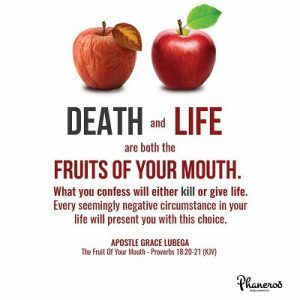 What you confess will either kill or give life. Every seemingly negative circumstance in your life will present you with this choice. PRAYER: Thank you my loving father for this knowledge. I never error in speech and thus see perfection in everything that I do. Lord, it does not matter the circumstance of my life, my lips keep knowledge because I am a messenger and mouthpiece of God. I choose life every day by my confessions. In Jesus’ name. Amen.